One of the sons of Noah, and the ancestor of a branch of the human race called "Japhetites." Japheth and his two brothers, Shem and Ham, were born when Noah had attained his five hundredth year (Gen. v. 32). It is not clearly indicated which of the three brothers was the eldest. Japheth usually comes third in order (ib. vi. 10, vii. 12, ix. 18, x. 1), but in the genealogy of their descendants the order is inverted (ib. x. 2-22). The words "the elder" (ib. x. 21) are more probably applied to Shem. Still, it seems, from a comparison of Gen. v. 32, vii. 6, and xi. 10, that Japheth was by two years Shem's senior. Japheth with his brother Shem covered the nakedness of their father when he lay drunken in his tent, for which deed he received from his father the blessing that his descendants might extend over the surface of the earth and that Canaan should be his as well as Shem's servant (ix. 23, 27). Japheth was married before the Flood, and had his wife with him in the ark (vii. 13); but his seven sons were born after the Deluge (x. 1). 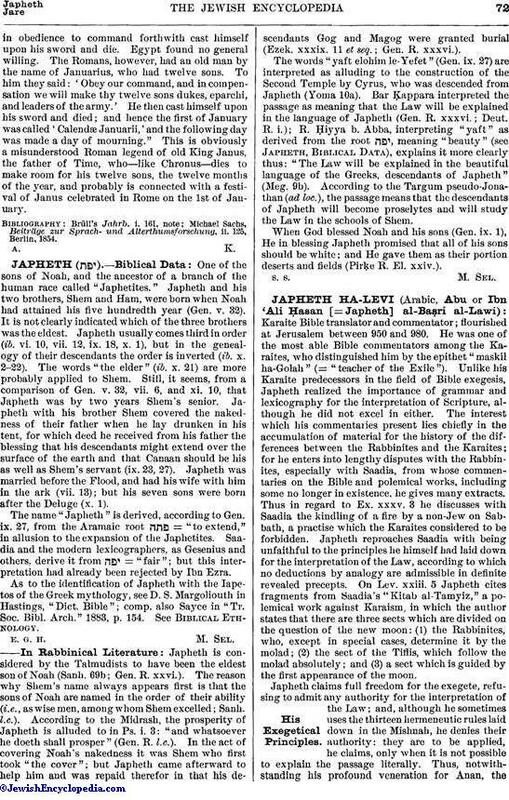 The name "Japheth" is derived, according to Gen. ix. 27, from the Aramaic root = "to extend," in allusion to the expansion of the Japhetites. Saadia and the modern lexicographers, as Gesenius and others, derive it from = "fair"; but this interpretation had already been rejected by Ibn Ezra. As to the identification of Japheth with the Iapetos of the Greek mythology, see D. S. Margoliouth in Hastings, "Dict. Bible"; comp. also Sayce in "Tr. Soc. Bibl. Arch." 1883, p. 154. See Biblical Ethnology. Japheth is considered by the Talmudists to have been the eldest son of Noah (Sanh. 69b; Gen. R. xxvi.). The reason why Shem's name always appears first is that the sons of Noah are named in the order of their ability (i.e., as wise men, among whom Shem excelled; Sanh. l.c.). According to the Midrash, the prosperity of Japheth is alluded to in Ps. i. 3: "and whatsoever he doeth shall prosper" (Gen. R. l.c.). In the act of covering Noah's nakedness it was Shem who first took "the cover"; but Japheth came afterward to help him and was repaid therefor in that his descendants Gog and Magog were granted burial (Ezek. xxxix. 11 et seq. ; Gen. R. xxxvi.). The words "yaft elohim le-Yefet" (Gen. ix. 27) are interpreted as alluding to the construction of the Second Temple by Cyrus, who was descended from Japheth (Yoma 10a). Bar Ḳappara interpreted the passage as meaning that the Law will be explained in the language of Japheth (Gen. R. xxxvi. ; Deut. R. i. ); R. Ḥiyya b. Abba, interpreting "yaft" as derived from the root , meaning "beauty" (see Japheth, Biblical Data), explains it more clearly thus: "The Law will be explained in the beautiful language of the Greeks, descendants of Japheth" (Meg. 9b). According to the Targum pseudo-Jonathan (ad loc. ), the passage means that the descendants of Japheth will become proselytes and will study the Law in the schools of Shem. When God blessed Noah and his sons (Gen. ix. 1), He in blessing Japheth promised that all of his sons should be white; and He gave them as their portion deserts and fields (Pirḳe R. El. xxiv. ).